When you move from one place to another we can help hook all them cables up again to help speed up the process of getting you back up and operational quickly. Call us today to see if we can help you. 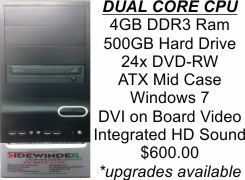 We custom build all our PC's, we can build any number of combinations that you may require. If you know exactly what you need we can help you with that,Unsure of what your needs or requirements are we can help you make the right decisions. This is a great entry level PC can do all the everyday tasks, upgrade options can help take it to the next level. A step up from the entry level computer giving the user more vesatility with more speed and larger storage space. The PC has a huge 3TB hard drive and also boasts a Blu-Ray Burner and a great 2GB Video Card. 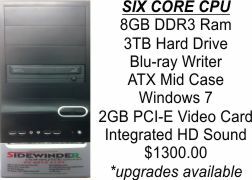 The upgrades for this PC an 8 Core CPU!!!!!!!!!!!!!!!! !